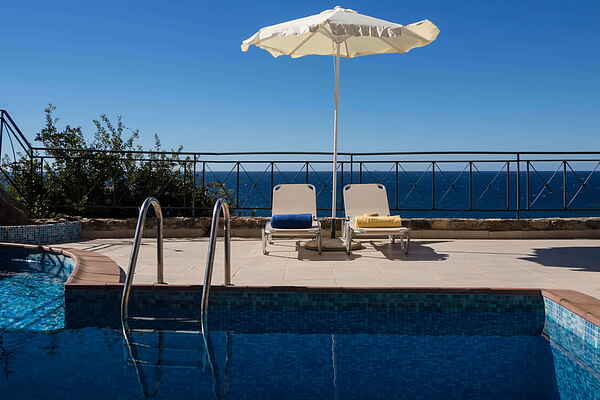 Meleti stone built villa is very close to the sea and offers magnificent sunset views. It is part of a two house complex and can accommodate up to 3 people in its 65 sqm of property. At the outside area you can find an 18 sqm swimming pool, sunbeds and a BBQ area. Once you enter the house you find the living room, fully equipped with comfortable sofas, TV, etc. The interior walls are stone built. Also a sitting area with a small table and a dining table by the kitchen. The kitchen has all modern comforts . Next to the double bed there is a jacuzzi and a bathroom that will satisfy even the most demanding guest. Meleti villa is located at Livadia village south of Chania known for its wild terrain and sence of peace. Nature with all its glory and amazing sea views are available at the villa and around the property. A car is neccessery especially when you visit one of the most beautiful beaches of Crete located only 12 km from the villa, Elafonissi beach. Elafonissi beach has crystal clear shallow waters and coral sands and attracts thousands of people from all around the world.